Days of Future Past from Page to Screen: What Happened to the Women? – Comic POW! X-Men: Days of Future Past opened in theaters across America this weekend. The movie is a strong installment in the X-Men franchise and manages to fix some of the continuity errors and poor decisions from past movies that have frustrated fans of the series. There are a lot of good things about the movie and it is very entertaining; however the decision to retell the comic story Days of Future Past in the movieverse that FOX has established led to some questionable changes. The following article contains spoilers for X-Men: Days of Future Past. The comic storyline that inspired the movie was written by Chris Claremont and John Byrne and published in 1981. It is a very famous storyline that introduces a dystopian future for the Marvel Universe where Sentinels have hunted mutants and other superhuman like the Fantastic Four to near extinction. The cover of Uncanny X-Men v. 1 issue #141 is so iconic that it’s been redone and referenced many times, including for a recent Uncanny Avengers alternate timeline story. Uncanny X-Men v. 1 issue #141 – Iconic Days of Future past cover. Chris Claremont is known for having developed the X-Men into a series that features many strong and complex female heroes and Days of Future Past is a great example of that. The primary focus of the story is Kitty Pryde who is sent back in time to her past body to try to change the future. Other extremely important characters are Storm who has just taken over leadership of the X-Men and Mystique who has just taken over the leadership of the Brotherhood of Evil Mutants. The three most important characters to the entire storyline are women, but it doesn’t stop there. Mystique’s second in command is Destiny and the telepath that sends Kitty back in time is Rachel Summers. There are unquestionably more women in key roles in the story than men. X-Men: Days of Future Past looks very different on screen. The focus character is Wolverine who is sent back in time to his past body to change the future. The other key players are Charles Xavier and Erik Lensherr (Magneto). The only character that maintains her importance from the original story is Mystique who has taken over control of Magneto’s organization and is the character whose assassination of a key figure will change the future. The changes make sense in the context of the movieverse because without a doubt Wolverine is the most developed character in the X-Men franchise. As far as audiences are concerned he is the main character of the series. The only movie that did not feature him heavily was X-Men: First Class which told Charles and Erik’s story. Previous to this movie Kitty Pryde was only a minor character so general, non-comic audiences don’t have a connection to her the way comic readers do. That being said, there is something concerning about FOX deciding to bring Days of Future Past to the big screen and marginalizing all of the women that the story is about. If they wanted to tell a Wolverine story or a Magneto story they had numerous ones to choose from, but instead they chose a story that celebrates Kitty Pryde and Storm and relegated them to very background roles. Kitty Pryde is in the film, but instead of being the hero who goes back and saves the day, she is the person who sends Wolverine back. She is shown to be intelligent and capable, but only in a nearly dialogue free background role. Gone is the comic character who, even in 1981, rejected Colossus’ concern about changing the future potentially affecting their relationship because she was so determined to save lives. I loved that moment in the comic because it showed a subversion of the usual gender stereotypes where the woman is assumed to be more concerned with things like love than the man who is usually portrayed as practical. Uncanny X-Men v.1 issue #141 – Kitty has her priorities straight. Instead the movie gave us a Kitty who silently spends the majority of the movie using unexplained powers to keep Wolverine in the past so that he can save the day. The original story was also an important one for Storm who had just taken over the leadership of the X-Men after Cyclops quit. She had to prove herself as a leader and was shown saving Wolverine’s life more than once as well as butting heads with him until he accepted her decisions. In the movie she was barely more than a cameo who fought in a few fights against the Sentinels. Mystique, however, was served well in the movie and given a role that fit her importance in the comic. The movie kept her from being the one note villain that she was in the comic (it’s hard to have complex motivations when you’re heading up the badly named Brotherhood of Evil Mutants). In the movie her character has been worn down by loss and is hovering on the edge of villainy, but is ultimately allowed to make the heroic choice to save the day. She is portrayed with complex emotions and motivations and is a very capable spy and fighter. The entire movie’s plot revolves around her choices. The X-Men comics have been full of complex and interesting women for decades. They have more popular superheroines than most mainstream comics and yet they are regularly marginalized in the movies. Jean Grey was given a lot of screen time in the past, but even the Phoenix story which should have been mostly about her, became a story about Wolverine and his grief. Although, there is hope that they will treat her better in the future now that X-Men: Last Stand seems to have been retconned by the timeline changes in X-Men: Days of Future Past. I like Wolverine just fine and Hugh Jackman has thoroughly embraced the role making him come to life, but if FOX really wants the X-Men franchise to take off as an interconnected movieverse the way Marvel Studios has done with its Avengers franchise then they need to branch out and give other heroes time to shine. It’s time for them to let other mutants step up and when it comes to the X-Men, some of the most popular characters are women. Let’s see some of them starring in their own stories for a change. X-Men: Days of Future Past. 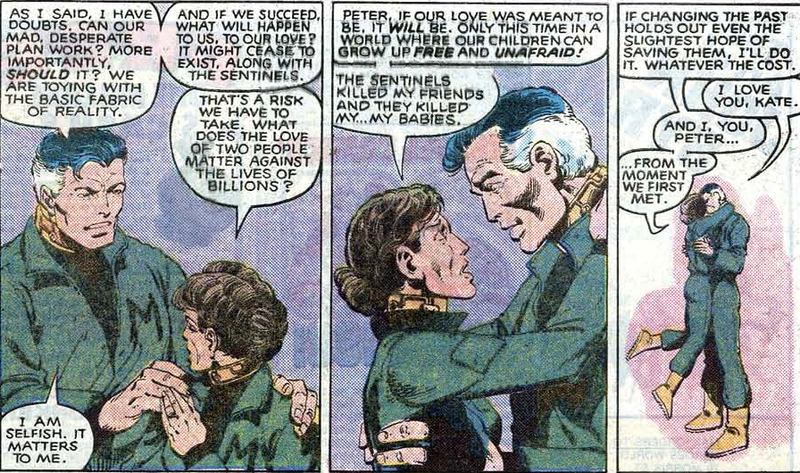 Written by Chris Claremont; art by John Byrne. Published 2011; collects Uncanny X-Men #138-143 and X-Men Annual #4. Find it on Amazon or buy it from comixology. 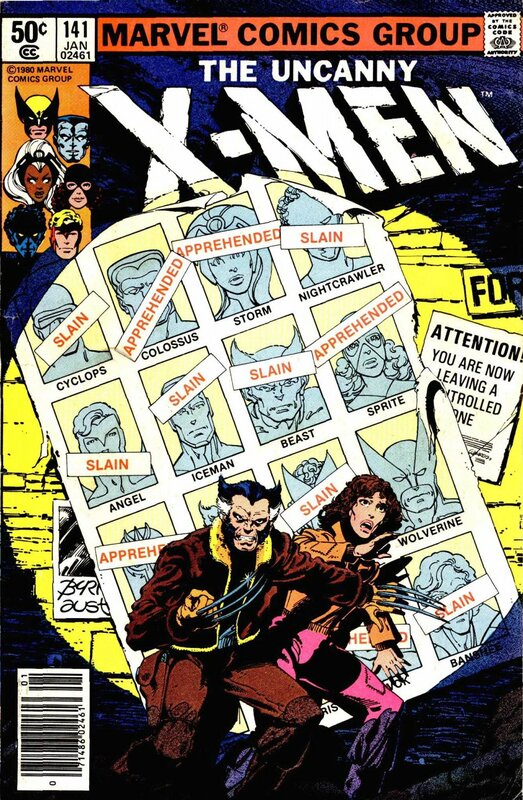 What do you think about Days of Future Past on page or screen? I’d love to discuss him with you in the comments!